Circular drive vs U shape driveway? New construction. tuscan style house. 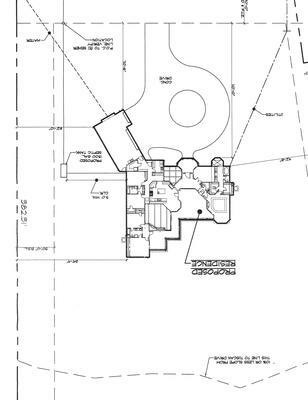 photo shows circle drive as drawn by architect but we had debated a u shape drive to widen the house a bit. would like to ensure 2 cars could pass but this would be only occasionally needed (a party a couple times a year). single story house. love to hear your thoughts, hopefully soon, our builder is pressing us for our decision. A circular driveway needs to be a minimum of a 50' diameter to be comfortable. The minimum width for two cars to pass each other is 18', I usually make it 20'. With the circular drive design you have this width would need to be carried around the entire circle. Be sure to use low plantings in the center that accent the front door, not block it. This is a common mistake. If you chose to use a U-shaped driveway, I would have the driveway as close as possible to each side property line. This will also help make the house look longer and get the front door more in the center of the U. The circular driveway is a more formal design calling for a focal planting or decorative item in the center of the circle. Maybe with a Tuscan home, your architect liked this look. The U-shaped driveway is a more casual approach. If the circle is large enough it should function fine. The U-shaped driveway gets away from the courtyard look and opens it up. Comments for Circular drive vs U shape driveway? In the life of a student when he go far away from his home, family and friends is the cause of to leave the country for getting higher education from abroad. You can get standardized information from paper writing service that help you in academic work. Hello, thank you so much for reviewing this plan and your suggestions by phone as well!! We do plan to move the entrance from the street so that it is centered on the front door and keep the circle drive at 18' -20' wide by narrowing the center planting area a little. At the street we will flare out the 18' drive to 22' or so. This suggestion looks to make a more balance approach to the house and brings the focus to the front entry. While the U shape has advantages, for our house we feel this is the approach we want and besides, the kids will love riding their bikes around the circle!